We heard of a cave in the nearby area, tucked away from view. An Okinawan had led us to it. The name of this cave is called Mayaa Gama. The term Mayaa means cat in the Okinawan language. 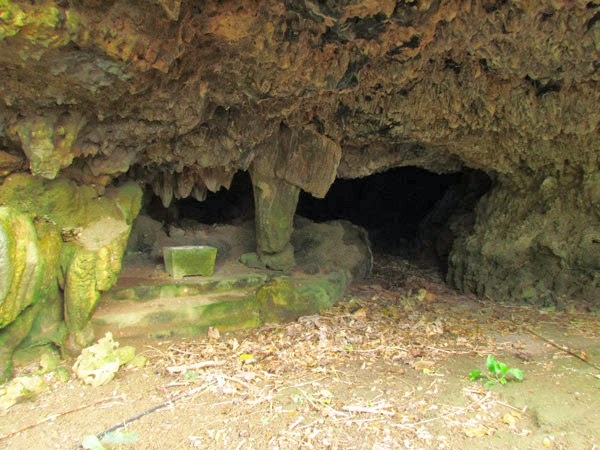 It is one of several 'Mayaa' caves that are in Okinawa Prefecture. The gentleman said it was called the cat cave cause the mouth of the cave looked like that of a cat's. The gentlemen did not know if anyone had died here during the war, but he did say people did use this place for refuge during the battle. Finding anything about this cave proved to be difficult even with local authorities, who were not really knowledgeable with the cave's history. 16th of January, New Year's for the Dead. To the Okinawans this is simply called “Jyuu Roku Nichi” which literally means the 16th Day in Japanese. Before I continue, the reader should know that I have no solid historical reference or source to pinpoint the origins of Jyuu Roku Nichi (jyuurokunichi). I am sure they exist. I just haven't found one that I can formally use as a reference. So I had to do my own investigation and ask various Okinawans on what their understanding of this special event meant to them. Internet search could only bring up blog articles (mainly in Japanese), so I can only tell you what they had mentioned, but cannot vouch for their accuracy. At the same time, I have no reason to dispute any of their claims. Also, it is important to note it is next to impossible to always define Okinawa in a rigid cultural model. Beliefs and traditions vary from family to family, village to village, and from island to island. How things are “supposed to be” may not always be the case. Lastly, I do not know all the answers - far from it! I will have to return to this article as time goes on, as my knowledge expands upon this topic. For those who have Okinawan friends or married to an Okinawan, I encourage you to ask them about the 16th of January. I am sure there are many commonalities as well as differences in nuances. I broke this topic into a series of questions. This will be the best way to convey what have I since discovered. Background. When did I first hear about Jyuu Roku Nichi? It was during the summer of 2013 when I was researching a folktale in northern Okinawa. It was basically a ghost story that had been handed down from generation to generation. In this village long ago, there was a legend of a man possessed by an evil spirit. He had wreaked havoc on the people. Wearied and exasperated, the villagers finally rose against him, killing him and expelling his evil spirit to the underworld. Fearful of the evil spirit's return, the villagers offered a sacrifice in return for peace....a pig's head. I will not go into further details about this particular ceremony cause my investigation is still ongoing. However, this sacrificial offering was done on the 16th of January. Even then, I was still oblivious to what that date had meant. It was only when my cousin read an article about this legend that the light bulb went off. She knew what 16 January had meant and revealed to me this Okinawan custom called Jyuu Roku Nichi. When exactly is Jyuu Roku Nichi observed? This is not as simple as one might think. In Okinawa, two calendars are observed. They observe the kyureki and shinreki calendar system, meaning the old and new calender, respectively. The shinreki calendar is essentially the Gregorian calendar. For the most part, most Okinawans adhere to this system for regular, daily affairs. When it comes to certain rituals however (particularly in more rural areas), villages tend to use the kyureki calendar which is based on the lunar cycle. It is not uncommon to find many rituals occurring on the day of the full moon (the 15th day). An internet search would seem to emphasize that Jyuu Roku Nichi is observed on the the kyureki calendar system. I would agree - for the most part. Traditionally, I believe this to be the case. That would mean that in 2014, January 16th of the kyureki calendar is February 15th of the Gregorian Calender (shinreki). Okinawans have also told me that some may observe Jyuu Roku Nichi under the shinreki system. A Kin Town resident had the opinion that most people from Kin observe the shinreki system, even for occasions like Jyuu Roku Nichi. Again, this really depends on the family, community, and what they were taught by their elders. But I would agree that Jyuu Roku Nichi is generally thought to be under the kyureki calendar system. Do all Okinawans celebrate Jyuu Roku Nichi? At a minimum, I would say most Okinawans know what the occasion is for. To what degree do they actively participate in it again depends on the family and the region they live in. An internet search would lead you to believe that the Yaeyama, Miyako, and Ishigaki islands heavily participate in Jyuu Roku Nichi. I can see this being true for remote islands, and in rural areas in northern Okinawa. Is Jyuu Roku Nichi celebrated every year? Okinawans here on the main island have told me it was mainly for those who had died that previous year. So in this case, not everybody observes it annually; only when a family member became deceased the year before. However, an internet search may give the impression that remote islands celebrate it every year much like they do "shimi" (an Okinawan tradition of visiting the family ohaka (grave) currently observed throughout the month of April). Though I do not have a first hand account on these islands, it wouldn't surprise me either if some of these islands do honor the occasion yearly. How do Okinawans honor Jyuu Roku Nichi? Okinawans have told me it is similar to what they do during regular new years or for Obon. Families may gather at the family butsudan, pray, and eat together. Some may gather at the family ohaka (grave) to clean it and then to pray. This depends on the family. Do mainland Japanese observe Jyuu Roku Nichi? Most people tell me that this is strictly an Okinawan tradition. However, there may be a small exception to the rule and this is based on a technicality. Amami Oshima and its nearby islands north of Okinawa Prefecture were once part of the Ryukyu Kingdom. They are now part of Kagoshima Prefecture which would now be considered part of mainland Japan. Those who have been to Amami Oshima that I have spoken to said they do speak a variant of the Okinawan language. The language similarity would imply that some of the Okinawan cultural traditions may continue in Amami as well. This is pure conjecture. Further research is required. Where did you Jyuu Roku Nichi come from? A good guess would be from China. But I have no solid historical reference to say exactly where and when this tradition arrived to Okinawa. More research is required. Why the 16th of January? This too is one for the O-files. If this was based on the lunar cycle then one can probably make the conjecture that it has something to do with the first full moon of the year. 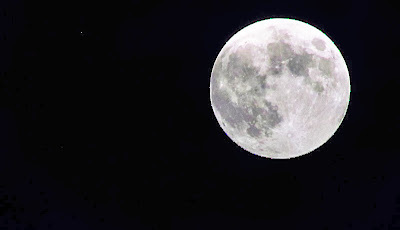 16 January of the lunar calendar would be the day after the first full moon of the year. Because the Okinawan belief system is deeply immersed with the spiritual world and the cycle of the moon, it wouldn't surprise me if there was a relationship between the two. This is speculation, and pending further research. I realize that there are a lot of unanswered questions. Getting the full story that covers the entire Ryukyu Archipelago will take some time. Some of you may have some experiences you wish to share. The following are some articles I found in English that may give you some insight to this intriguing occasion. Two and half years of mapping places on Okinawa, you get to meet a lot of people from different walks of life. I met Milano 2 years ago at a local cafe where she was working as a barista. She was just a happy-go-lucky gal, cheerful and eager to serve anyone a fresh brew of coffee. She always laughed and always had a smile. There was never a day I saw her otherwise. Two years later she is still that same smiley and cheerful girl I met when I first walked in. Milano, is the quintessential Okinawan girl – nice heart and great attitude, all with an endearing personality. So it was a bitter-sweet moment for me when I heard she was leaving for the mainland. I know a bigger and brighter future awaits Milano, but the cafe will be a little less brighter without her. I sat down with her a few days before she left. She was excited, yet I could tell she was going to miss her friends and family. I had asked Milano, “How do you do it?” “How do stay upbeat everyday?” She talked for a few minutes and despite the language barrier, I knew what she was trying to say. She likes to make people happy. It is in her nature,...be it a kind smile, a funny laugh, or a welcoming “hello”. That is who Milano is. So I asked if I could share this picture of her to at least give others a dose of what I was talking about. Her smile says it all, and it truly represents that quintessential Okinawan girl. Sharing it was also my way of saying “thank you” to Milano and to a larger degree, a way of preserving her in my memory. Okinawans, like Milano, have a certain magic in their personalities. It becomes contagious. Nothing you can fully grasp, just admire. It's just there... a mystery all to itself. And like Milano, Okinawans have a certain kindness about them. You see it when they are children till the time they become parents, to that moment they finally become that Obaa-chan or Ojii-chan. Milano is but one, but there are many just like her. Good people with good hearts – the true treasures of Okinawa.